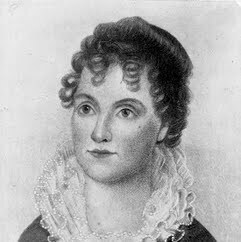 Hannah Hoes Van Buren was the wife of the eighth President of the United States, Martin Van Buren. She died in 1819, before Martin van Buren became President. He never remarried and was one of the few Presidents to be unmarried while in office. During his term, his daughter-in-law, Angelica, performed the role of hostess of the White House and First Lady of the United States. Martin, aged 24, and Hannah, aged 23, married on February 21, 1807 at the home of the bride's sister in Catskill, New York. They had been childhood sweethearts and were first cousins once removed through his mother.